UPDATE: The Poet just sent us an article from the Detroit Free Press. 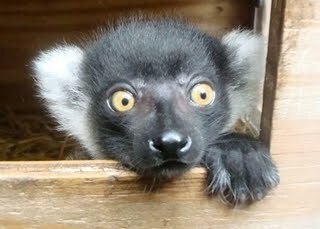 The Detroit Zoo introduced a baby lemur named Kintana, which means Star in Malagasy . Read the full article, click here. We are learning about how zoo's can help, and harm, the efforts to save species from extinction. We cannot imagine a world without lemurs, can you? Help us learn about Madagascar first hand, share us with friends. Have you taken a challenge lately? We'd love to hear from you, click here to get started. Please take a moment to tell us where you are from, click here. I thought it was funny to see a couple of lemurs in the library!